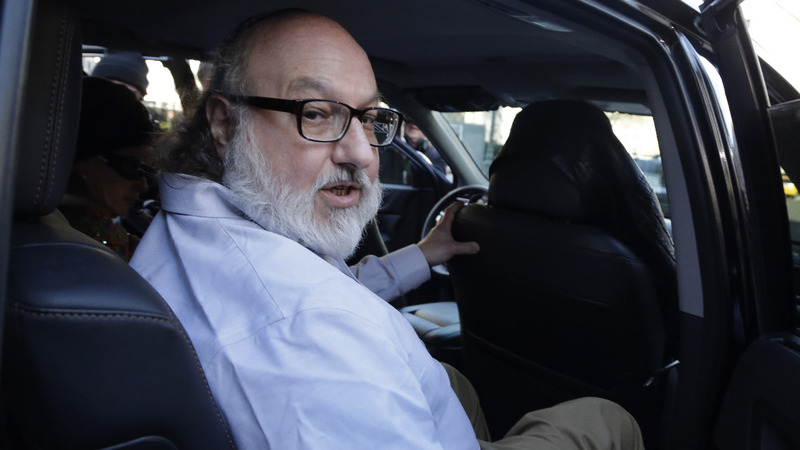 WASHINGTON -- Convicted spy Jonathan Pollard was released from prison Friday, culminating an extraordinary espionage case that complicated American-Israeli relations for 30 years and became a periodic bargaining chip between two allies. Within hours of his release, Pollard's attorneys began a court challenge to terms of his parole that they called "onerous and oppressive," including requiring him to wear an electronic GPS ankle bracelet and the monitoring of any computer that Pollard may use either personally or at a job. Pollard was driven away from the federal prison at Butner, North Carolina, before dawn in heavy fog. Hours later, he checked in with probation officers at a federal courthouse in New York City, then emerged into a throng of journalists. He wore loose-fitting khakis, a blue yarmulke and a slight smile. "I can't comment on anything today," he said, with his wife, Esther Pollard, on his arm. One of Pollard's lawyers and a U.S. marshal, grasping Pollard firmly by the arm, escorted him through the crowd of jostling photographers to a waiting car. Pollard had been granted parole this summer from a life sentence imposed in 1987. His lawyers said in a court filing that he had been given a job in the finance department of an investment firm in New York City. They didn't disclose the name of the company. The terms of his parole require him to remain in the United States for at least five years, though supporters - including Netanyahu and some members of Congress - are seeking permission for him to move to Israel immediately. In their petition to a court for an easing of his parole restrictions, Pollard's lawyers complained that wearing a GPS monitor would be harmful to his health because he has severe diabetes and suffers chronic swelling in his legs and ankles. They said the computer monitoring was unnecessary because Pollard was no longer in possession of any classified information. "I don't think there's any doubt that the crime merited a life sentence, given the amount of damage that Mr. Pollard did to the United States government," said Joseph diGenova, who prosecuted the case as U.S. attorney in Washington, D.C. "I would have been perfectly pleased if he had spent the rest of his life in jail." Pollard, a former Navy intelligence analyst, was arrested Nov. 21, 1985, after trying unsuccessfully to gain asylum at the Israeli Embassy in Washington. He had earlier drawn the suspicion of a supervisor for handling large amounts of classified materials unrelated to his official duties. Although he has said his guilty plea was coerced, he has also expressed regret, telling The Associated Press in a 1998 interview that he did not consider himself a hero. Under sentencing rules in place at the time of his crime, he became presumptively eligible for parole in November - 30 years after his arrest. The Justice Department agreed not to oppose parole at a July hearing that took into account his behavior in prison and likelihood to commit future crimes. The parole decision was applauded in Israel, which, after initially claiming that he was part of a rogue operation, acknowledged him in the 1990s as an agent and granted him citizenship. Pollard's lawyers also have sought permission for him to travel immediately to Israel, and two Democratic members of Congress - Eliot Engel and Jerrold Nadler, both of New York - have called on the Justice Department to grant the request so Pollard can live with his family and "resume his life there." The congressmen say Pollard accepts that such a move may bar him from ever re-entering the U.S. The White House has said that it has no intention of altering the conditions of Pollard's parole.